Okra is a tapered-shaped green vegetable, resembling a human finger in size, dimension and shape. Hence, “ladyfingers” is one of its common names.Its tube-like shape is related to its composition, in that it houses a slimy, transparent liquid that is emitted when cooked. This slimy liquid is often used as a thickener in soups, stews and gumbos. Typical in many southern dishes, “soul food” and Cajun cuisine alike, it is often fried in cornmeal, pickled, or fried and seasoned whole. 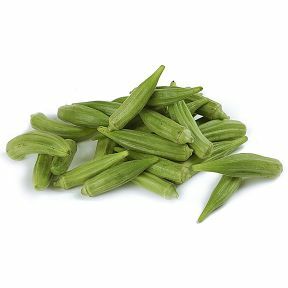 Names: Okra, Ochro, Ladyfingers, Quingombo, Quiabo, Bamia, Bamie, bhindi, bindi, gumbo, gombo. Source: Mexico and the United States. Handling: 45-50°F. Keep cool and dry. Varieties: Annie Oakley, Blondy, Burgundy, Cajun Delight, Clemson Spineless, Emerald, Lee, North and South, Louisiana Green Velvet and Prelude (PVP), Hindu.